28 November Is Alzheimer's Disease Hereditary? Alzheimer's disease, the most common cause of dementia, affects more than 5 million Americans. As many as 10 percent of people over 65, and an estimated 1 in 3 people over 85, have been diagnosed with the disease. Medical experts have identified several risk factors for it, one of which is family history. Individuals who have at least one immediate family member impacted by Alzheimer's are more likely to develop the disease themselves. For those who have multiple family members with Alzheimer's, the risk is even higher. Research suggests that genetics play a role in determining whether a person develops this form of dementia. However, researchers agree that a combination of genetic and environmental factors contribute to the prevalence of Alzheimer's. Scientists classify genes associated with Alzheimer's into two types, risk genes and deterministic genes. Risk genes increase the chance that a person will develop a particular condition-- in this case Alzheimer's. The most significant of these hereditary components is the apolipoprotein E-E4 gene (also called APOE e4). Everyone inherits some form of the apolipoprotein gene from each parent, but APOE e2 and APOE e3 do not appear to contribute to dementia. While a person who inherits one copy of APOE e4 is at risk of developing Alzheimer's, the likelihood increases if two copies are passed down. Researchers conclude that having this gene may cause the onset of Alzheimer's at a younger age than is typical. Scientists have identified other genetic characteristics that may contribute to late-onset Alzheimer's, but are still trying to understand how they do so. These genes affect certain aspects of brain health, such as nerve cell communication and inflammation. Those who have the deterministic genes for Alzheimer's will eventually show symptoms of the disease. The primary genes in this category are responsible for coding three proteins- Presenilin-1 (PS-1), Presenilin-2 (PS-2), and Amyloid Precursor Protein (APP). Deterministic genes cause excessive amounts of the amyloid-beta peptide protein to accumulate in the brain, creating sticky "clumps" that lead to nerve cell deterioration. This form of the disease is called autosomal dominant Alzheimer's disease (ADAD) or familial Alzheimer's disease. With this type, it's common for multiple family members across several generations to be affected by Alzheimer's. Symptoms may appear as early as age 30 or 40, and usually before age 60. Since only a few hundred extended families globally have been identified as having these genes, familial Alzheimer's is relatively rare, representing perhaps between 1 percent and less than 5 percent of all cases worldwide. Some of the culprits behind Alzheimer's, such as age and heredity, can't be controlled. However, medical experts believe that, in most cases, the disease is caused by a combination of elements, some of which may be influenced by lifestyle factors. Heart Health. Doctors have found a link between poor heart health and poor brain health, perhaps because the heart is responsible for supplying blood to the brain. If the heart isn't functioning normally, the brain may also be negatively impacted. Latinos are one-and-a-half times as likely as whites to develop Alzheimer's, while African-Americans are twice as likely. While it isn't completely understood why the risk is higher for these populations, it may be because cardiovascular disease is more prevalent in these groups. Head Injuries. Research also suggests that there may be a link between head injuries and a propensity to develop Alzheimer's, especially if the injury caused the person to lose consciousness or the head trauma happened repeatedly. You can protect yourself and your loved ones by buckling up every time you ride in the car, and making your home as fall-proof as possible. Know of a loved one showing signs of Alzheimer's Disease? Discover When is the Right Time for Homecare? Since most people are not guaranteed to have Alzheimer's, they may be able to reduce their risk of developing it. Healthcare experts have identified six pillars of Alzheimer's prevention. Regular Exercise. The Alzheimer's Research and Prevention Foundation reports that exercising regularly can reduce your risk of Alzheimer's by up to 50 percent. Exercise supports connections in the brain, so it can help to prevent Alzheimer's or slow the progression of the disease in those who already display symptoms. Social Engagement. Meaningful social interaction causes the brain to thrive, and may protect against dementia. Healthy Diet. Alzheimer's is sometimes referred to as "diabetes of the brain." Inflammation and insulin resistance destroy neurons and make it more difficult for brain cells to communicate. Avoiding sugar and trans fats, while consuming plenty of fruits, vegetables, and foods rich in omega-3 fats can prevent metabolic disorders that hinder brain function. Folic acid, magnesium, fish oil, and vitamins D and B12, which can be obtained through supplementation, also promote brain health. Mental Stimulation. Challenging the brain keeps neurons active. Some ways to maintain or augment cognitive functioning include learning new things, multitasking, memorizing facts, playing strategy games (puzzles, riddles), varying your routine, and keeping a journal of what you observe in your daily experiences. Quality Sleep. Research reveals a possible link between poor sleep patterns and higher levels of the aforementioned beta-amyloid, which further disrupts sleep. Getting treatment for sleep apnea and having a regular bedtime routine can help you get a better night's rest. Stress-management. Chronic stress can inhibit nerve growth in areas of the brain responsible for memory, increasing dementia risk. Stress-management strategies can lessen the negative effects of stress. Maintaining a healthy weight, controlling blood pressure and cholesterol, eliminating tobacco, and avoiding excessive alcohol consumption can further cut down on your Alzheimer's risk. 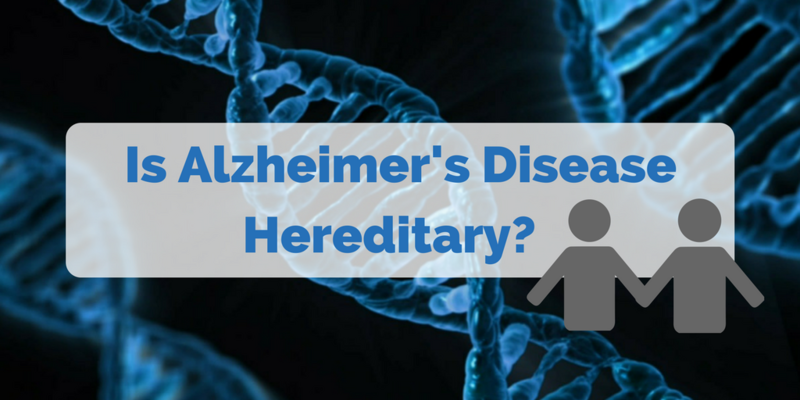 While hereditary components are among the primary risk factors for developing Alzheimer's, only about 20-25 percent of people with risk genes for the disease eventually develop dementia. Since there is no certainty that people with these genes will go on to have Alzheimer's, they may be able to minimize their risk by adopting healthy lifestyle habits. These strategies can keep other chronic conditions at bay, too, allowing seniors to experience enhanced longevity and quality of life as they live out their golden years. If you know of a loved one who is suffering from early signs of Alzheimer's please reach out to go over the options you have to feel more comfortable about the future.